A coach accused of abusing his tennis player daughters says they fabricated the cruelty claims against him because of his separation from their mother. John De'Viana is charged with physically and emotionally abusing his children Monaei and Nephe in attempts to make them Wimbledon champions. At Southwark Crown Court, he denied a series of alleged mistreatments. But he admitted calling Nephe, now 19, a dog in expletive-ridden notes because she "moved like an animal". Asked about the language, he said: "I'm not aiming that particular derogatory comment at Nephe, it is to give me an idea of what she is doing on court, she is like an animal moving around the court. "Rather than writing all that down I use a specific word." Another note, which called Monaei, now 21, an "idiot" was to "emphasise certain points" in his mind, the court heard. "These are coach's notes I have made for myself and my team and during a period of a match when a match goes on at such a rapid pace, I do not have time to make notes," he said, adding the children never saw the note. 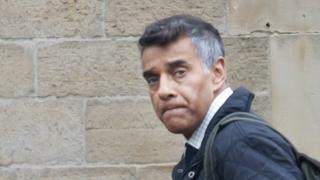 The 54-year-old, from Ilford, east London, denies two counts of child cruelty. In court he also denied a claim he punched and kicked Nephe while covering her mouth when she was about 12, saying there were too many video cameras around. The last time the three had spent any time together was when he took them home before training started because he knew he was going to leave, jurors heard. "I was quite tearful. I called them both over and put my arms around them and said how much I loved them," he said. "They were pushing themselves away from me as if it was a laugh and a joke." He said they were angry at him because he did not explain why he separated from their mother. "I can only assume they are pretty upset with me as a father," he told jurors. Both the defendant's brother, Jude, and the girls' former coach, Gavin Bradford, denied ever seeing him display hostility to his daughters.